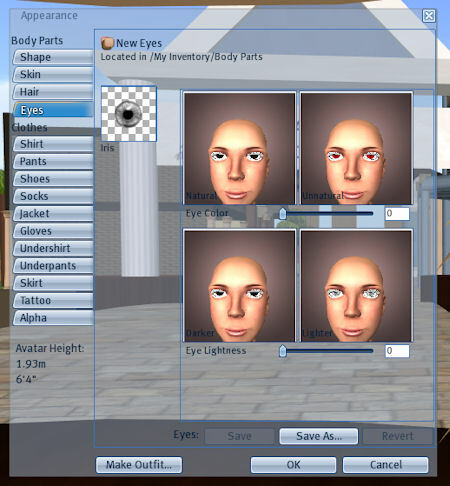 However, I created several images of eyes using the Avatars-3D template for those who either don't have a graphics program or who don't want to spend the time creating the images themselves. 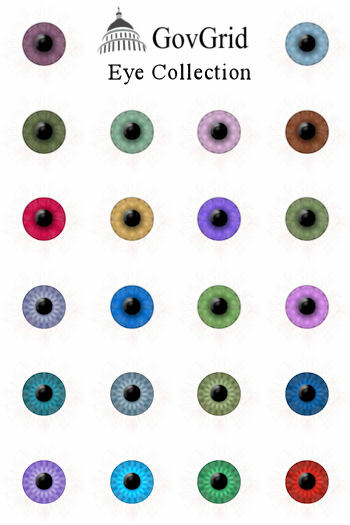 You can download a zipped file of the eye images by clicking the image below. Once you have the file downloaded, unzip it to somewhere on your computer. Then log into your favorite OpenSim grid. Go to your inventory, and at the top of your inventory window, click "Create." Arrow down to "New Body Parts" and then in the next menu, choose "New Eyes." This should have created a new object in your inventory named "New Eyes." And it should now be highlighted by your cursor. If not, you can look for it in your inventory. Right click this new object and choose "Wear." Then right click yourself and choose "Appearance." This should bring up the Appearance menu. 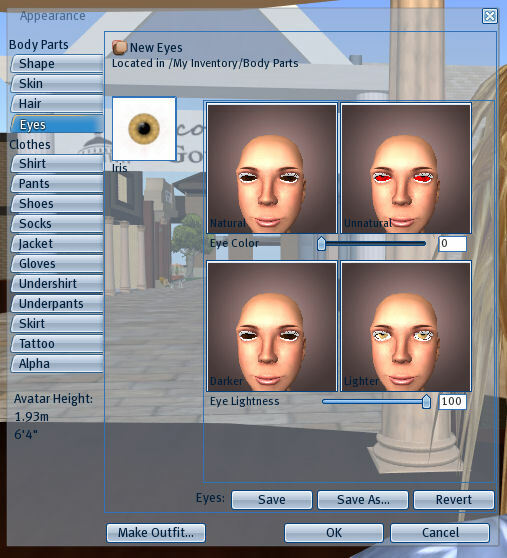 After the file is uploaded, you can either drag it onto the box in the appearance window labeled "Iris" or you can click on the box labeled "Iris" and browse in the window that pops up to the eye texture you uploaded. Then click "Save As..." This brings up a small window where you can type in the name of your new eyes. Then click "Save" on this small window. This should make the small window disappear. Then finally, click "OK" back on the appearance window, and you now have your new eyes! And you should be wearing them! The image files and eyes are released through a Creative Commons NonCommercial-ShareAlike 3.0 Unported License. You don't need to attribute GovGrid and you can give away the eye image files and the eyes, but you cannot sell them or repackage them under your own name or brand.